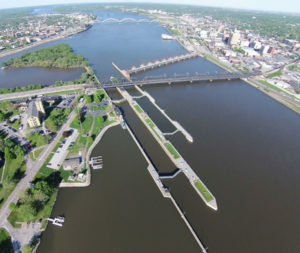 Flooding is forcing the U.S. Army Corps of Engineers to close seven locks on the Upper Mississippi River. Lock 12 in Bellevue is closed upstream from the Quad Cities, along with six more downstream including Lock 16 at Muscatine, 17 at New Boston, 18 at Gladstone plus 20 through 22 at Canton, Quincy, and Saverton. Marshall says they’ll be closed at least a week or two and the timing depends a lot on the weather. The same goes for Locks 16, 17 and 18. In the Quad Cities, Lock 15 at Rock Island is still open, along with Lock 14 at LeClaire, 13 at Fulton, 11 at Dubuque, and 19 at Keokuk. The Corps of Engineers will close them when the water reaches specific stages, which are different at each location. In addition, the Coast Guard recommends recreational boaters avoid the Upper Mississippi. It has already closed the river south of Chester, Illinois.